You might think of Google Street View as that feature of Google Maps that let’s you look at ground level photographs of your childhood home, a new restaurant you are trying to locate or some other street-side destination. But for several years now, Google has been expanding Street View to all sorts of locations that, well, don’t have any streets. You can use Street View to climb up the Swiss Alps, trek in Antarctica or tour some of the world’s greatest art museums. 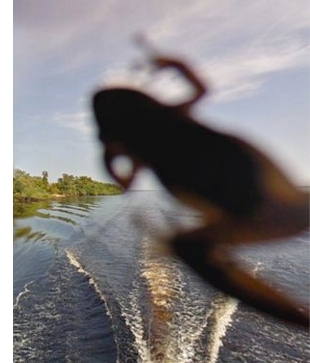 And, now, you can also use Google Street View to explore along the Amazon River. At the moment, only around 50 kilometers (30 miles) of the Amazon River near Manaus, Brazil have been Street View-ified. But even that small fraction of the river’s length was a massive nine-month undertaking that Google embarked on together with the Foundation for a Sustainable Amazon. A big part of the challenge was that the 360-degree panorama photos required to create a Street View are gathered by a special camera-mounted tricycle known as a Trike. The Trike worked well in areas where there was a road or path. Securely mounting the Trike onto a river boat was more difficult. Then there are the environmental factors to deal with, from the humidity to the frogs jumping onto the camera lens (pic to right). Altogether, the Trike took over 50,000 panorama photos that Google had to stitch together using sophisticated software. 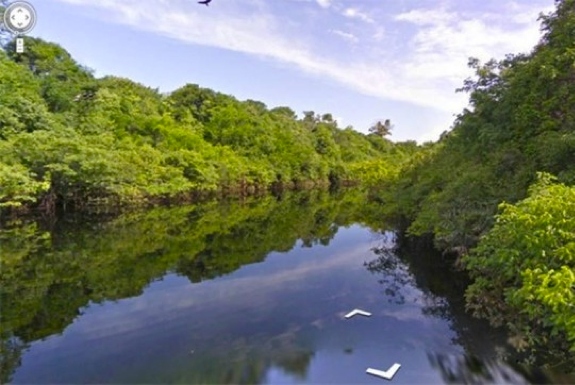 Google is working on bringing other sections of the river to Google Street View in the future. In the meantime, the best way to get a look for yourself is to take your own Amazon River cruise. Trike optional. wow awesome stuff. I am actually hoping to do the real thing at the end of the month but until then this will keep my excitement up!